And what have I been doing? I can't believe it is summer already! But I have been busy with Big Picture Scrapbooking, working on the house (painting), re-doing the studio, learned how to knit and crochet, learning how to cook, and spent time with my family. Setting up this blog over here at Typepad has been a long process - so many options, I almost thought it was better to stay where I was at because it was comfortable and easy. But here's to change! I also learned (from the talented Kayce) how to make my own blog banner, I just love that I know how. I feel like a digital scrapbooker playing with layers! LOL! Painting rooms in the house - my husband thinks that the rooms are actually getting smaller with the layers of paint on them...he's crazy. 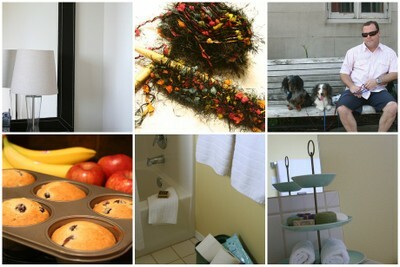 I re-painted my pantry/laundy room and guest bathroom Hawthorne Yellow by Benjamin Moore. It is my favorite yellow of all time - bright yet understated. Then the guest bedroom was repainted Wedgewood Gray (also by BM) and it is my all time favorite blue. I know the name says gray and that is what it looks like going on - I FREAKED out just a little when it looked like wet cement, but knew better to wait until it dried. I love it, it reminds me of the coast. Which is the theme in that bedroom! Then I tackled the master bedroom and master bath. The master bathroom is Copley Grey - very dark, reminds me of staying at the W hotel or Westin...now I just need new tile and need to do something with the wood cabinets, and while we are at it new shower door. The master bedroom which is pictured above is Alaskan Skies, almost white but not. I like to change out our bedding so I went for a neutral color this time. This color brought a lot of light in the room which we wanted to take advantage of having southern exposure. But with any small update brings other BIG updates - you change the paint, then you have to change the flooring, change the flooring you might as well change your window coverings... yikes. I plan to give you full picture updates on my studio - it has gone through a major furniture move and I will share detailed shots of how I ogranize things. I always like to see the details so I am going to give it to you!